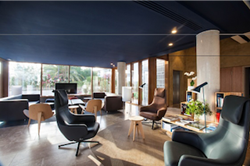 In its commitment to culture and art, OD Hotels in Spain has launched “Book Bars” in cooperation with Taschen publishing house. The wide-ranging collection is an avant-garde service for lovers of art, architecture, fashion, the vanguard, and design. Guests can enjoy the books in the lobby community space while enjoying a coffee or cocktail such as one of their famous gin and tonics. In addition, all OD Hotel deluxe rooms will offer a carefully curated selection of works published by the German firm. Other guest rooms feature a select book on an aspect of local design, art and style. Both guests and visitors can purchase their favorite books at each of the hotels’ reception and receive a 10% discount. Available currently in each of the boutique Spanish chain’s hotels in Ibiza, Mallorca and Barcelona, the Taschen “Book Bars” will also be available in OD’s future projects to be launched shortly in Miami, St. Tropez and Madrid. To mark the launch of the new “Book Bar” concept, Taschen and OD Hotels presented an exhibition by photographer Thomas Laird at OD Barcelona in early June. “Murals of Tibet” is an inimitable work with a print run of only 998 copies that shows, for the first time, the most beautiful murals of Tibetan Buddhist culture. Each one of the books is signed by the Dalai Lama. Author Thomas Laird was on hand for the presentation and a part of the international proceeds were donated to the Mind & Life Foundation. For more Information on OD Hotels, visit http://www.od-hotels.com/. Taschen was established in 1980 by Benedikt Taschen, who continues to own the company. In its beginnings, Taschen was basically a comic-book shop; Benedikt Taschen launched the project with the purpose of making the art market more democratic. This is he achieved in the first decade of activity with a catalogue that included books such as those on Van Gogh or Dalí at affordable prices. OD Hotels is a new hotel concept based on the most contemporary and progressive form of Mediterranean luxury — functional, cozy, inclusive and responsible. Culture, art, cuisine and leisure come together. Each property is founded on the following five pillars: excellent location, the reuse and renovation of abandoned buildings, cosmopolitan character, art-centric philosophy and commitment to sustainability. OD Hotels currently has five hotels in Spain: three in Ibiza (OD Ocean Drive, OD Can Jaume, and OD Talamanca), one in Mallorca (OD Port Portals) and one in Barcelona (OD Barcelona). The latter, which was inaugurated in the summer of 2017, is located in one of the best areas of the city center — the Eixample neighborhood, just over 200 yards from Passeig de Gràcia — and stands out for its vanguard spirit and design. The company is currently in full expansion, opening new hotels both in Miami and on the French Riviera in 2019. OD Hotels is a member of L.E. Hotels, a collection of boutique luxury hotels which includes close to 200 of the world's best hotels.